By Mantu Joshi. Paperback, Kindle, Nook, e-book. 162 pages. ISBN 978-1-933084-25-1 (pbk). $11.95 (pbk). Publication date: January 15, 2014. Available through Amazon, BN.com, The Book Depository, and several other on-line retailers as well as Ingram, Follett, and Brodart for bookstores and libraries. Parents of children with neurobehavioral special needs such as Autism, ADHD, FASD, learning disabilities, attachment problems, trauma, mental health diagnoses, developmental and intellectual disabilities, and others will find hope, solace, and solid strategies in this book. 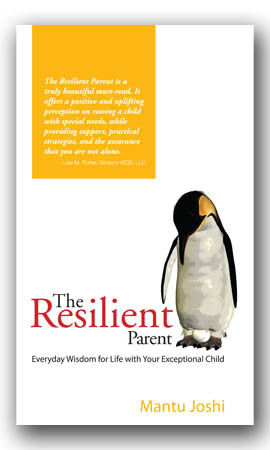 The Resilient Parent brings the role of parents to a new level, acknowledging that without a well and empowered parent we can not have a well-functioning or self-actualized child. How can we treat children with the hope of increasing function and ignore the parent? The answer: we can’t. Joshi understands as only someone who walks the walk can. A Must-Read for every parent with a child with special needs — maybe every parent. Also a Must-Read for any caregiver who touches the life of a special child. So fine… just such an important contribution!